According to a January, 2019 report from Davos, the world now produces 44.7 million tons of electronic waste every year. That’s 125,000 Boeing 747 jumbo jets, or about 4,500 Eiffel towers. No matter how you measure it, that’s a lot of waste. Worse yet, the rate of e-waste production worldwide continues to rise, meaning this problem won’t go away soon. If you’re trying to run a responsible business, this can cause you some problems, not least of which is the fact that you need to upgrade your equipment every few years, and the old stuff needs to be disposed of. Here’s everything you need to know about e-waste. E-waste comes in many forms, including televisions, monitors, computers, printers, peripherals, audio and stereo equipment, DVD players, video cameras, telephones, fax machines, photocopiers, cell phones, routers and other wireless devices, and video game consoles. Basically, anything with a silicon circuit board can be considered electronic waste. Our electronics contain a variety of heavy metals and other contaminants, like lead, mercury, cadmium, and barium. When electronics are improperly disposed, for example, if they’re crushed in a garbage truck and dumped in a landfill, these contaminants won’t be properly contained, and can leach into the environment. When this happens, the whole environment and community suffers. Animals can die or be born with birth defects. Plants and crops can be killed off. Groundwater can become contaminated. Mercury and cadmium can kill people in all kinds of nasty ways, or cause them to have kids with birth defects. Not only is improper e-waste disposal unethical, it’s also illegal. If your business improperly disposes e-waste, even by accident, you can be fined by the state or federal government. Federal fines can be as high as $25,000 per violation. That means that if you have an intern clear out an old supply closet and they throw 20 Windows 95-era laptops in the trash, your business could end up getting fined $500,000. That’s an expensive mistake! Besides the contaminants, there are valuable metals in household and office electronics. Gold, silver and copper can all be worth salvaging. How this is done depends on the recycling service. Some domestic services specialize in recycling e-waste. Most of them work for charity, or are startups trying to find a more efficient way of extracting precious metals. Ironically, it currently costs about as much to extract gold and silver from circuit boards in the US as the metal itself is worth, so accepting free electronics isn’t a profitable business model – at best, it’s a break-even proposition. Other, less reputable services are based in developing countries, usually in Africa. Because labor costs and the cost of living are so low in these countries, companies can recycle electronics for a tidy profit. Unfortunately, these businesses have no safety standards, and some of them employ children to burn circuit boards in open pits, exposing them to all kinds of toxic fumes. Much like with recycling, donating your electronics is another viable solution for getting rid of your old electronics. Some services, like charities and homeless shelters, need machines for basic tasks and are happy to take whatever you give. If you’re personally familiar with someone from the organization you’re donating to, this can be a great way to cheaply get rid of your old electronics. On the other hand, some “charities” are just the same third-world, fly-by-night recycling operations we’ve already talked about. Steer clear of these. You’re not helping anybody by donating to them, and you may be hurting them. Even if you’re donating to a reliable organization, you’ll want to make sure your devices are thoroughly scrubbed of all your customer data before you hand it over. 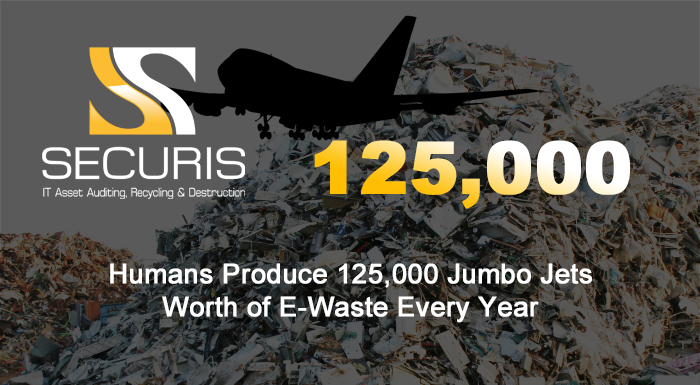 Reputable e-waste disposal services like Securis are the best option when it comes to disposing e-waste. We help you stay compliant and ensure your customer’s data remains protected throughout the recycling process. You also won’t have to worry about toxins and heavy metals from your electronics ending up in the environment. If you would like to learn more about our services, please contact us today.